This article provides details about managing servers within your AccountCenter. Sign in to your AccountCenter. 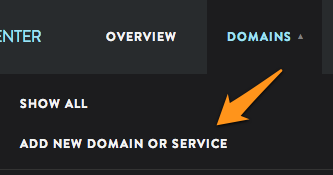 Hover over the Domains tab, then select Buy Another Server. Look through your purchase options and select the appropriate service. This article will address how to add new hosting services; other services are covered in different articles, which are linked below. See Add a domain or subdomain to add an existing domain to your server (FREE). See Managing Domain Registrations to register or transfer a domain registration. 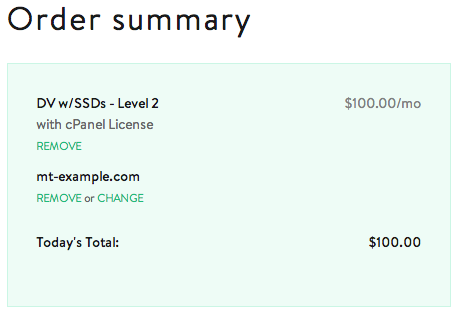 If you are adding a DV or Fully Managed VPS, you will need to select some additional options like the level of service you want, how you will be billed and which panel you wish to use, cPanel or Plesk. The example below is for the DV w/SSDs. If you are purchasing any other service, you will not see this step. 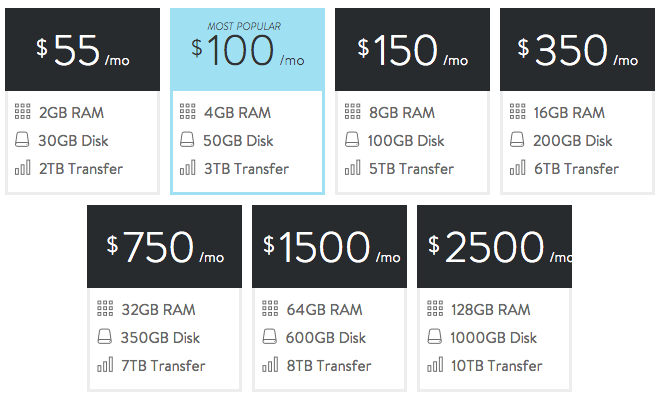 For a new hosting service: You may associate a domain that you already own with this server. Just enter the domain you wish to use, select "I already own this domain" and click ADD THIS DOMAIN. If you would like to register a new domain for this hosting service during this process, select "I want to register this domain now" and click ADD THIS DOMAIN. If you aren't ready to link a domain to the service yet, select "No thanks, I'll skip adding a domain." Once you've chosen your hosting service and added it to your cart, you will see your order summary updated. 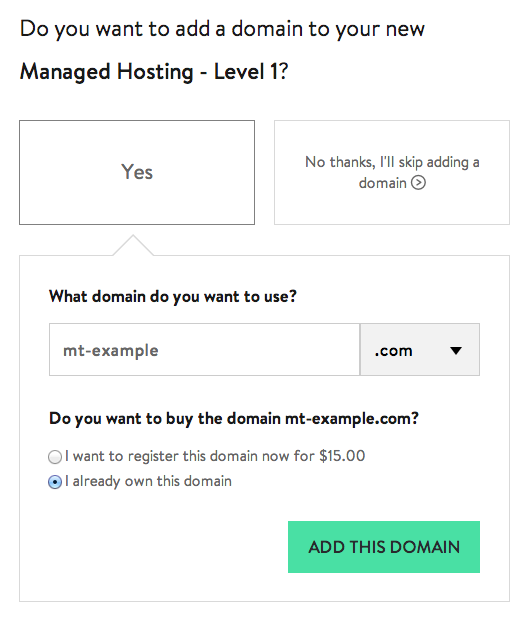 In the example below, we've also chosen to add the domain mt-example.com to the DV we're purchasing. Since we already owned the domain and chose the option "I already own this domain" earlier in the purchase process, you'll notice that it does not display a charge for domain registration. At this point, You will be able to review all of the items added to your cart. You will also notice some recommended services below. These recommendations are customized for the type of service you are purchasing. 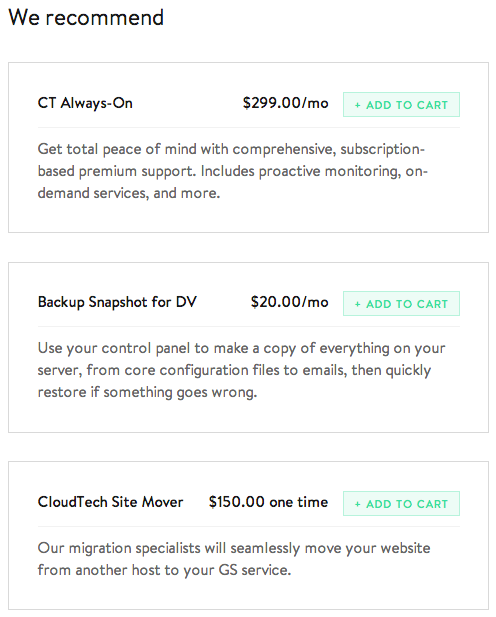 Since we are purchasing a DV in this example, one of the items recommended is a Snapshot Backup. You may chose to add any of these before proceeding with your purchase. Towards the bottom of the page you have the option to enter a promo code, referral domain or sales agent. If you do not have anything to enter here, this section may be ignored. Once you've reviewed this information and you're ready to checkout, click CHECKOUT. Here you will review your credit card details and the total charge, then click PLACE YOUR ORDER. Once your payment is received, your order will be processed within about 20 minutes. If you return to the Overview tab in the AccountCenter, you should see your new service listed. You will receive an activation email once your service is ready. Please wait until you receive this email to start configuring your service. That's it! Thank you for your business! Please see this article for step-by-step instructions: Using the Upgrade Server tool. Remember when closing a server, ALL DATA will be removed. We strongly suggest you backup any server before you request to close. Find the server you wish to close and select the red close icon. Additional information can be found here: Close a service or account. If you would like to transfer a server to another Media Temple account, there must be a support request from each account owner with a request of where the server is to be moved to and from. Once we have a support request from both account owners, we will move the server and update both support requests once the transfer is completed. No changes will be made to the server that is moved, and the next time you log into your AccountCenter you will see the service has been moved to the requested account. The owner of the new account will receive an AccountCenter Welcome Letter. The account owner will also need to update their billing information within the AccountCenter.